"Despite surpassing many of the placement statistics this year, FORE School of Management has remained under reported. This needs to change." Dr. Jitendra K. Das strongly believes that as the Director of FORE School of Management, he has a responsibility towards the legacy left behind by the founder fathers of FORE. To his credit, Dr. Das has been able to instill this ‘FORE First’ attitude in every aspect of the institution. Dr. Das strongly believes that internal restructuring is a continuous process that has three foci - administration, Faculty and student. A look around FORE School of Management actually makes you realize that in terms of infrastructure, and administrative and pedagogical software, what is offered to the students are at par – and sometimes, even better – than most of the top-notch B-schools in the country. No wonder FORE School of Management has seen a steep hike ininterest shown by the Industry.One of the first initiatives that Dr. Das introduced on taking over as the Director of FORE School of Management was the inauguration of the Centre for entrepreneurship development, which is headed by the Professor – HR. The one big mindset change that Dr. Das has been instrumental in is the profile of students coming into the FORE School of Management. As an Engineer himself, Dr. Das has a deep understanding of how CAT and other such exams are tilted towards students from an Engineering background. He has consistently been trying to offset the advantage through various practices in FORE School of Management, so that his classes are diverse and carry a world of business wisdom. Incidentally, FORE School of Management also has a certain weightage for aspirants from the Northeast and Jammu & Kashmir, to retain the right cultural mix and regional diversity. In short, a chat with Dr. Jitendra K. Das, Director, FORE School of Management, will sooner or later veer to FORE School of Management and innovations in the field of business education. Clearly, he is always bouncing ideas about FORE School of Management in his head, and once in a while he doesn’t minding bouncing them off an interested visitor. Dr. Jitendra Das is one of the leading luminaries in the Indian business education space. Dr. Das’s phenomenal journey began with a B.Tech and M.Tech from IIT Delhi. He went on to receive his PhD from University of Toronto, Canada, where he was also the recipient of the most coveted ‘Connaught Fellowship’ for three years. 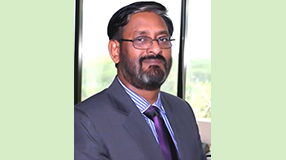 As an academician, Dr. Das has sterling contributions as a full time Faculty of IIM Lucknow, and as a Visiting faculty at IIM Ahmedabad, IIM Kozhikode, SP Jain Management Centre Singapore, Danube Business School, Danube University Krems, Austria. Before taking over as Director, FORE School of Management, New Delhi he was the Founder Dean of the Noida Campus of IIM Lucknow. Prior to his shift into the academia, Dr. Das had excelled in the corporate world working with WIPRO and the DCM Group. He has numerous national and international awards and recognitions to his name.